Villa is a four-bedroom home perched in the hills just above the beautiful seaside town of Opatija, Croatia. Enjoy serenity, beaches, breathtaking views and hospitality. The recently-built luxury villa offers an idyllic and serene place to relax with breathtaking views out over the Adriatic Sea and coastline. Opatija, a renowned resort on Croatia's Kvarner Riviera offers beaches,watersports, bars, restaurants, discos, casinos, shops, open-air films and concerts. House is the nearby seaside resorts of Ičići, Lovran, Volosko, Medveja and Mošćenička Draga. Family bathroom consists of a large bath with overhead shower, heated towel rail and a wash basin. Open plan kitchen/dining room. Facilities available are: oven, hob, dishwasher, microwave, fridge/freezer, all kitchen utensils, kitchen linnens and crockery. Access to laundry room (washing machine) as well as pantry/utility room. Patio door leads to roofed outside terrace and the gardens. Spacious, clean, with space for coats, shoes and luggage. --The master bedroom has one double bed (and space for 1 extra single bed if requested), its own ensuite bathroom with huge shower, a walk-in wardrobe and private balcony with amazing sea views. --Amelie room consists of a double bed, wardrobe, chest of drawers, writing desk and beautiful sea views through its two windows. --Elena is a double bedroom, with double bed, wardrobe, chest of drawers and writing desk. Views towards the rear of Villa Amelie. Can be arranged to your wish, whether with an office desk and chair, or with up to 4 single beds. Exit onto roofed terrace. View over Kvarner Bay, the garden and parking. The spacious living room with views over Kvarner Bay, with exit onto side covered terrace. Oak wooden flooring, feature stone wall, satellite TV, wood-burning stove, wi-fi access (unlimited) and video/DVD player. 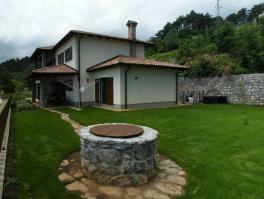 Villa Amelie is set within green belt obove marina Ičići and beneath the National Park Učka. The tranquil and secluded setting of the villa itself provides excellent opportunities for relaxation, all the while being near to beaches and local amenities. Magnificent views over the Kvarner Bay are something you really have to experience!